From the shape of dried gourds used by travelers to carry drinking water, metalworkers patterned their versions of these flasks. From the metal examples, with their tall tapering necks and flat oval bodies, artists in glass and ceramics made their own purely decorative versions of these pilgrim flasks. The gilded knobs attached to the sides above and below the bulge of the body imitate the loops that would have originally attached the flask to the pilgrim's side; glassworkers retained them as a decorative reminder of the vessel's earlier function. On each side of the flask, two boys dressed in tunics, sashes, and high boots stand in a hilly landscape surrounded by oversized flowers, with tufts of grass, cattails, and other plants in the foreground. The boys hold a blank shield between them. Although the source is unknown, the boys may have been copied from a contemporary engraving. 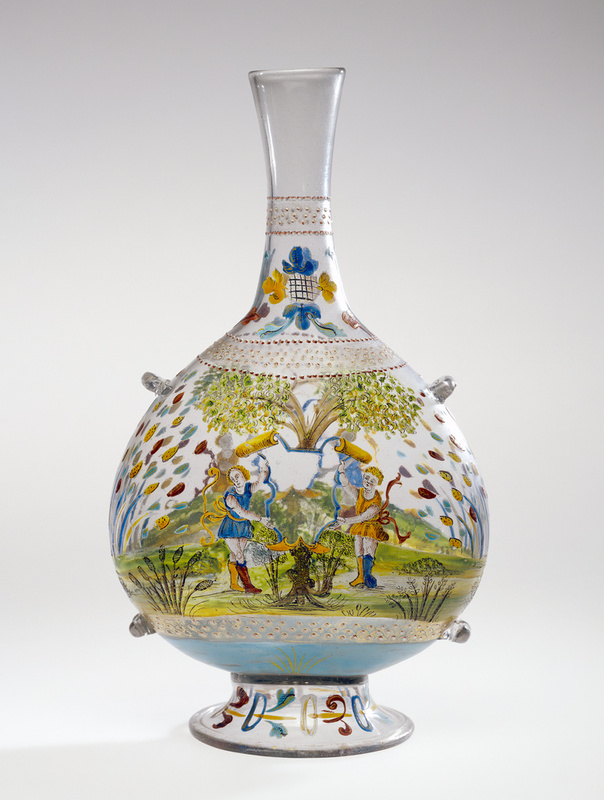 The vessel was probably produced for general stock in a glass workshop, with the coat of arms of its purchaser painted later on demand. Robinson, J.C. Notice of the Principal Works of Art in the Collection of Hollingworth Magniac, Esq. (London, 1861), p. 82, no. 152. "Acquisitions/1984." The J. Paul Getty Museum Journal 13 (1985), p. 246, no. 185. "Recent Important Acquisitions Made by Public and Private Collections in the United States and Abroad." Journal of Glass Studies 28 (1986), pp. 102-03, no. 13. Bremer-David, Charissa, et al. Decorative Arts: An Illustrated Summary Catalogue of the Collections of the J. Paul Getty Museum (Malibu: J. Paul Getty Museum, 1993), p. 218, no. 380. Hess, Catherine, and Timothy Husband. European Glass in the J. Paul Getty Museum (Los Angeles: J. Paul Getty Museum, 1997), pp. 96-98, no. 23. Wilson, Gillian, and Catherine Hess. Summary Catalogue of European Decorative Arts in the J. Paul Getty Museum (Los Angeles: J. Paul Getty Museum, 2001), p. 236, no. 485. Hess, Catherine, ed. The Arts of Fire: Islamic Influences on Glass and Ceramics of the Italian Renaissance, exh. cat. (Los Angeles: The J. Paul Getty Museum, 2004), pp. 100-01, pl. 13.